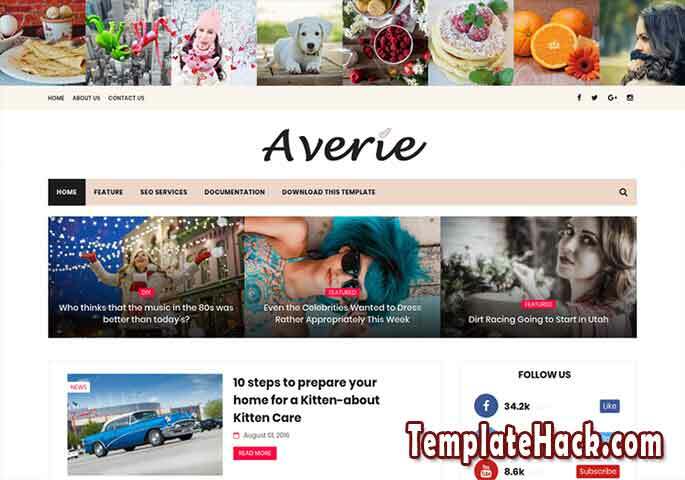 TemplateHack.com - Download Averie Minimal premium blogger template. Averie Minimal blogger template is the best combination between stylish and magazine blogger template to gave a new feel on your personal blog. Use this template for makeup blog, personal blog, recipes blog,travel blog, shop blog, handcrafted blog, decoration blog, magazine blog, journey blog, gallery blog, travel blog, etc. It is html5 blogger template adapted from wordpress design to make your blog look proffesional. ads ready, adapted from wordpress, wordpress look, SEO ready, breadcrumbs navigation, SEO friendly, dropdown menu, elegant, 2 column, 3 column footer, 1 right sidebar, black, minimalist, instagram ready, post thumbnails, clean, responsive, email subscription widget ready, girly, whatsapp sharing buttong, social bookmark ready, page navigation. magazine blogger template, shop blogger template, makeup blogger template, decoraation blogger template, handcrafted blogger template, travel blogger template, lifestyle blogger template, sport blogger template, personal blogger template, fashion blogger template.